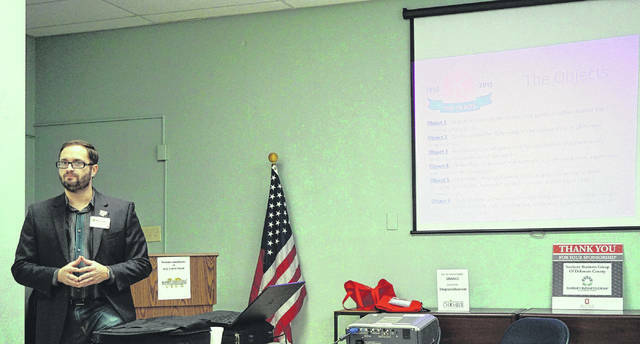 Sunbury may be getting a new service organization — members of Kiwanis International spoke to individuals interested in the club at an informational meeting last week. “I think it is so cool to be part of an organization that helps children worldwide,” said Dan Litzinger, governor of the Ohio Chapter, the largest Kiwanis chapter in the country. For example, Kiwanis has contributed more than $105 million to successfully eliminate iodine deficiency disorders (IDD) globally. IDD is considered the leading preventable cause of mental and developmental disabilities in the world. Currently, Kiwanis has raised more than $110 million to eliminate maternal and neonatal tetanus worldwide, a disease that claims 34,000 people annually. However, Kiwanis also helps children closer to home, if clubs prefer. In Ashville, Ohio, members realized that some children didn’t have meals over the weekend and only ate while they were at school. Now, the local Kiwanis chapter helps provide weekend food packs for four elementary schools and are looking to expand to more buildings in the district. In Newark, the Kiwanis puts on the annual Strawberry Festival after the city stepped down. And at the popular Circleville Pumpkin Show, the Kiwanis has a pumpkin pancake booth. One idea for the Big Walnut area is to build an adaptive playground with equipment that is fully accessible to all children and has no physical barriers. Jim Janosik, a Kiwanis member for 24 years, said in addition to the regular Kiwanis, there are clubs for all ages and abilities: K-Kids (ages 6-12); Builders Club (12-14); Key Club (15-18); Circle K (college students); and Aktion Club (adults with disabilities). The Kiwanis was offering an introductory membership rate of $100 for a year and a half. The next informational meeting is at 6:30 p.m. March 22 in the Sunbury/Big Walnut Area Chamber of Commerce meeting room, 39 E Granville St, Sunbury. “Interested parties may reach out to Jim Janosik directly at jimjanosik@aol.com or 614-433-7024,” said Sarah Maar of the chamber in an email. For more information, visit http://ohiokiwanis.org.